AGA is a grassroots organization in the Mid-Columbia region whose purpose is to identify, discuss, and advocate for the needs of elders and caregivers in our area. 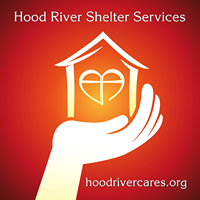 HRSS provides a warm, dry shelter to anyone who needs it during the months from November to March. The Shelter operates from Riverside Church from 6pm to 7am and provides a hot meal in the evening, snacks and breakfast to the guests. The Shelter is managed by volunteers and supported by GEM and the Gorge community. Providing emergency assistance (gas, food, lodging) in times of crisis. CGCAN educates, organizes and motivates Columbia Gorge activists to reduce and eliminate fossil fuel usage and climate change, at all levels from individual to global. We encourage clean local renewable energy, conservation, community sustainability and resilience throughout our National Scenic Area.